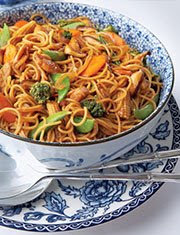 Trader Joe's - or should I say, paternalistically and a bit uncomfortably, Trader Ming's - "low fat" chicken lo mein tastes pretty awesome. It's not quite as good texturally as a fine Chinese bistro or when you get it from one of those hole-in-the-wall Chinese places where you order by pointing at glow-up pictures, but it's close, doesn't taste low-fat at all, and is in the upper tier of Trader Ming's products I've tried for sure. By which I mean, the chicken tastes normal. Cooking it takes a couple of steps, so it's something best to prepare before you go to work. My only real qualm: a paltry serving. Split in half, the bag is really not enough for two lunches: best to supplement with some mixed greens and/or a couple of Trader Joe's veggie dumplings (very highly recommended, although my coworkers asked "what smells like onion bagels").